Konami’s Castlevania is an unusual series. For the longest time it was a consistently poor seller in its native Japan, but incredibly popular in the West. Konami kept the series alive when many companies might not have. It has so far graced more than ten different game systems, plus a handful of computers. Except for a few unpopular attempts at 3D the series is still in fabulous 2D. For most of its run the Castlevania protagonist’s main weapon was a whip. A few games have strayed from this, but even when a new weapon was offered a whip could usually be equipped, or a whip-wielding alternate character selected. The series started on the Nintendo Entertainment System hardware, and has appeared on most systems since then. The only Nintendo platforms since the NES without a Castlevania were the Virtual Boy and GameCube. The series has graced the NES, Super NES, Megadrive (Genesis), MSX, Amiga, Arcade, X68000, PS1, PS2, N64, GameBoy, GBA, DS and several more. The main player character frequently changed, and in several instances a female took the lead. The artists at Konami were very successful, creating characters from one hardware generation to the next that maintained the same spirit as the original games while taking advantage of the new hardware’s abilities. Below is every pre-DS 2D Castlevania main character released from 1986 to 2003. They’re divided into six distinct groups, more or less along hardware lines. In addition there are the ugly-vanias, the ports to platforms that might better have been ignored. During the NES’ reign the hero changed very little, only a handful of pixels in the shoulders changing from one sprite to the next. It could be said that Konami had maxed out the hardware from the start, using all four available colours and gaining only few pixels in size by the time the third game was released. The original GameBoy presented serious challenges for all pixel artists, but Konami’s artists rose to the task. The heroes in all three GameBoy games retained their whip toting appearance, even while inexplicably becoming left handed. One can’t help but wonder what Konami’s artists were thinking when, in 1998, two years after the release of the Playstation and Saturn, they were asked to produce another GameBoy iteration, with all the resolution, colour and memory limitations that entails. Konami started hitting their stride in the early 1990s, but they suffered two rough patches when the limits imposed by the NES and GameBoy were replaced by the excesses of newer, more powerful hardware. First in the arcade, and later on the SuperNES, Konami struggled to get a handle on the additional colours and higher resolutions available to their artists. The 1993 release of Castlevania on the X68000, a powerful Japanese computer from Sharp, seems to have been an attempt to return the series to its core values, discarding several of the more troubling innovations from the SuperNES’ Castlevania IV. And then, also in 1993, the PC Engine Super CD-ROM version was released. It became the gold standard for many years, and the same sprite was used in the second SuperNES game, and again in the Playstation and Saturn sequels. These games, though, came after one more awkward release: the Megadrive game was inexcusably garish, even moreso than the relatively hideous arcade version six years before it. Luckily the player’s sprites weren’t as bad as the rest of the game. For a brief moment Konami blew out all the stops with the Playstation and Saturn games. For the most part they were visually identical, with new 32-bit sprites fluidly animated with billowing capes and glowing motion trails. Before starting the game as the new protagonist Alucard, the player controlled the old Richter in a re-enactment of the final boss fight from the PC Engine and SNES Dracula X games. In the Playstation version this same sprite was used throughout the bonus game where the player controlled Richter, but a new Richter sprite was drawn for the larger bonus levels in the Saturn release. For the second time, Konami used a back-hand attack for the player sprite. During this golden age there were several sprite updates. The Saturn version of Symphony had a remade Richter sprite (above), and the Playstation re-release of the X68000 Dracula included another remade sprite, shown below. The next major change in the graphic appearance was with the launch of the GameBoy Advance. Castlevania: Circle of the Moon was released alongside the system, and it was immediately slammed in the gaming press for being too dark to play on the GBA’s appalling screen. The second GBA release went for the other extreme, and featured a larger, brighter, and vague-looking protagonist, with a thick blue outline and oddly flat appearance. As if realizing their mistake, Konami found a comfortable middle ground for the final GBA outing. Not for the first time, they gave him a knife instead of a whip. Konami never really seems to have settled on an attack stance. Starting with the GameBoy, the player sprite alternated more or less equally between a right-handed attack and a left-handed backhand attack. The backhand attack allows the player character’s chest to face the player, instead of the shoulders, allowing a little more design creativity since few outfits are as interesting on the back as they are the front. It’s a subtle, but interesting change. It’s a sad fact that the Nintendo DS is becoming the last bastion of good pixel art. While most new mobile phones have better screens, the DS is a platform better suited for gaming.. As they release more games, Konami stays with the effeminate Victorian theme, eschewing the whip-wielding muscleman for fancy fops in frilly frocks. And the series’ first female main character. Konami anounced, showed off, but never released a version of Castlevania for Sega’s short-lived 32X. Assuming the following screenshot is real, it’s more or less all there is to show of this effort. It has been said that the assets created for this game were used for Symphony of the Night. In 2009, Konami released Castlevania: The Adventure Rebirth, for Nintendo’s Wii. 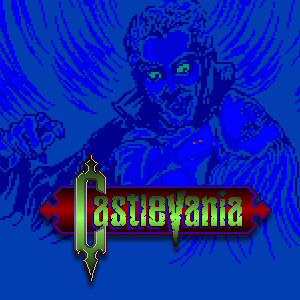 This download-only title was a simple game, loosely based on the 1989 GameBoy Castlevania: The Adventure. It features classic gameplay with overhauled graphics, and is a rare gem in the WiiWare library. In 2010, the Xbox 360 received the first multiplayer game in the series. All the sprites are from other games, and are not shown here. Unbeknownst to most game players in the West, four computers received Castlevania ports. Konami themselves created the MSX and Commodore 64 versions, while the Amiga version (and probably PC as well) was licensed to Novatrade. The Konami-made conversions were the better of the four. The MSX sprite is very nearly identical to the NES version (but for a handful of pixels and a more detailed whip), and the C64 sprite was about as good as the hardware could get. The Amiga version suffered though. A lot. Though while this misshapen dwarf retains little of the manly good looks his brethren enjoyed, the DOS sprite was even worse. While it appears the same Amiga sprite was used, it has fewer colours and a bizarrely pink whip. There was an unreleased Castlevania: Symphony of the Night for Tiger’s ill-fated Game.com handheld. The sprites were four-colour versions of the Playstation/Saturn version, and Alucard, poor spawn of Dracula, looks downright awful. The Castlevania series has had a lot amount of mature content in it, which is probably expected in a game about vampires and their violent slayings, but what’s surprising is the number of breasts in the game, from enemies to the hundreds of statues in the background. And then, from the arcade game, there’s this statue. I would very much like to know what this represents, and I encourage your comments on this enduring mystery.